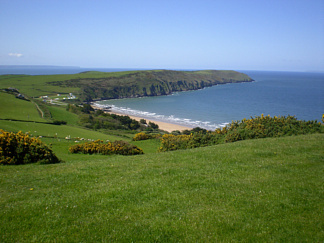 Pickwell Manor Farm Holiday Cottages are on the hills above Woolacombe Bay. The beach at Putsborough is a pleasant walk or short drive away. 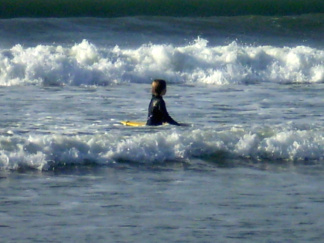 It has golden sands, rock pools, and dunes, and is very popular with surfers. Croyde beach is also close by. Our self-catering cottages have panoramic sea views. The Atlantic Ocean stretches out before you, bordered by Baggy Point and Lundy Island. The cottages are West facing - ideal for watching the sun setting over the sea. 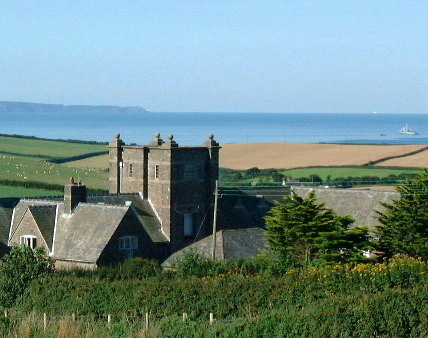 Pickwell is a rural hamlet in an Area of Outstanding Natural Beauty. The coastline pictured above is a ten minute walk away. The wilds of Exmoor are within easy reach by car. The view from our cottages is shown below .